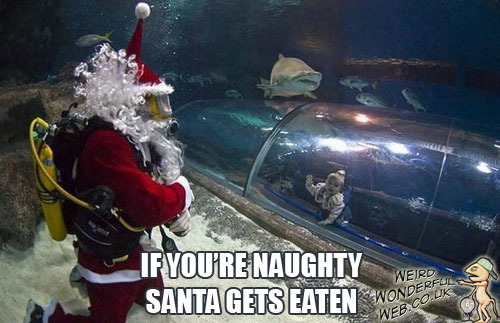 Weird Wonderful Web: Be good or Santa gets it! Well 'tis the season for parents to use this time of year as leverage to control their small children. You've all heard or maybe even said something similar to: "now be good - or else Santa won't bring you any presents." Or even worse the child is threatened with the possibility of being 'black-balled' and ending up on Santa's "Naughty List". I would imagine these threats probably work very well in subduing the little ones, but if all that fails, take the child to a mock (your choice) Santa execution like the one above. They'll soon get the picture.